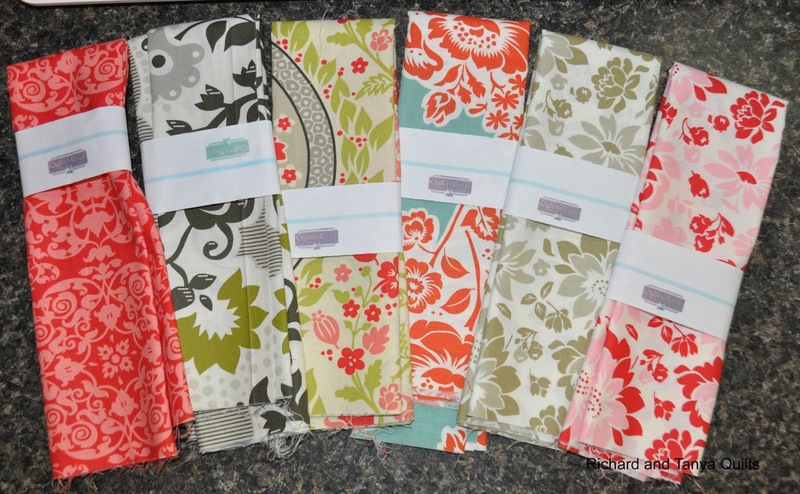 It has been far too long since I have had a giveaway and so today to celebrate a great and fun and active summer I would like to give away 6 Fat Quarters from the line Secret Garden a Michael Miller fabric line. Tanya and I have been busy this last month. In addition to the quilts and patterns we want to do personally we have had 2 quilts that have been made (one made and one in process) for customers on Etsy. And to add a crazy twist to our life my oldest son James just got a job away from home. He is on a construction crew in a small town 4 hours drive from home. So to celebrate the joy of success in making quilts and the sadness (or happiness) of our oldest leaving home for the first time. We are giving away this pile of fabric to 1 lucky winner. Contest will be open for 7 days closing midnight of the August 6th (or as soon after as I think to turn the comments off on this post). Now how to enter. All Entry options are optional enter as many or as few ways as you desire. Leave a separate comment for each. 1) Leave one comment stating something Happy or Sad going on in your life it can be short or long. 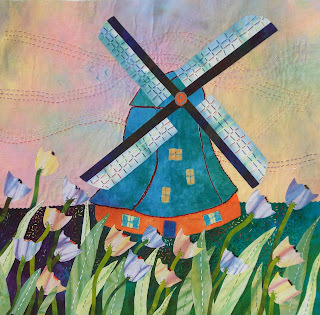 6) Comment on one of my Craftsy Projects or Quilt Patterns and as a bonus I will give you a free pattern of your choice from my Craftsy Patterns. 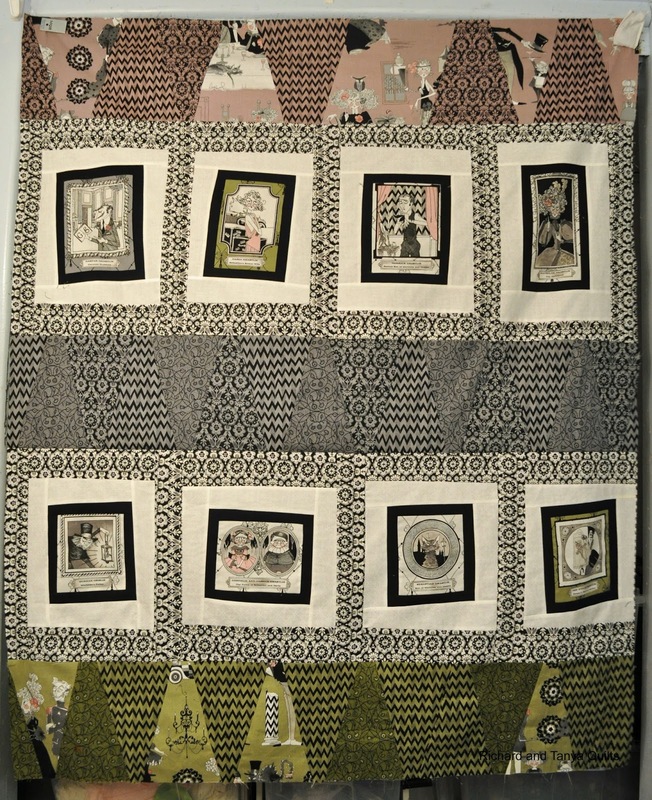 This is a pink and owl quilt from our stash. 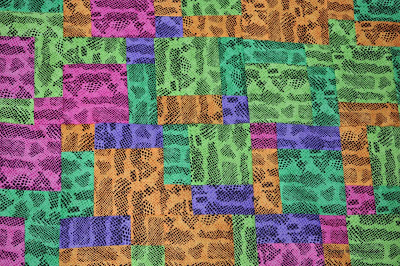 It is rag quilt #4 from our flannel stash. We added it to our Etsy store and it has already sold. We have been making a twin size version as well for a custom order on Etsy, that one we had to go buy more flannel for. You are all thinking that its not Halloween yet and I am jumping the gun a little. Last week while cleaning out the stash pile (yes it turned into a pile rather then a organized mess) We found our Ghastlies, we finished one quilt last year that we totally forgot to blog about that. It was made for Tanya's Sister and then started making the wonky picture blocs. The strips of pink, green, and gray were also made last year. 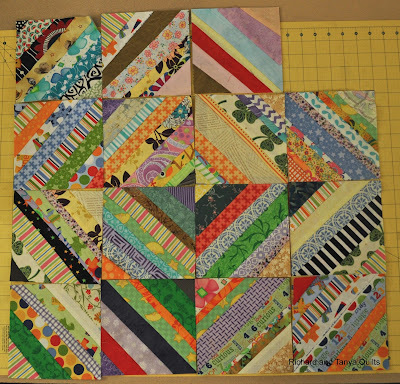 I added the sashings around the blocks and made them wonky rather than square (I wanted them off kilter more then they were already) and then sewed the 5 strips together. We have enough Ghastlies to make another top and most likely 3-5 wall hangings. Our plan is to sell the quilts and keep one of the wall hangings. One thing I find funny about the Ghastlies is no matter how I try to take pictures of them, they look blurry. I don't know if its just too busy that the camera can't focus, but it looks so much better in person then it does in the picture. I have of course still been working on the granny squares. I think I have enough done now to make 2-3 more baby quilt tops. I can't wait to get all of them done, they are so much fun. Last Saturday Tanya and I sorted and went though the mess (stash) and found a bunch of things and put others away, sorted and filtered the mess and also realized we have TOO MUCH material (I think I need to get to quilting more quilts) any way the above top was made out of 20 blocks I found in the pile. 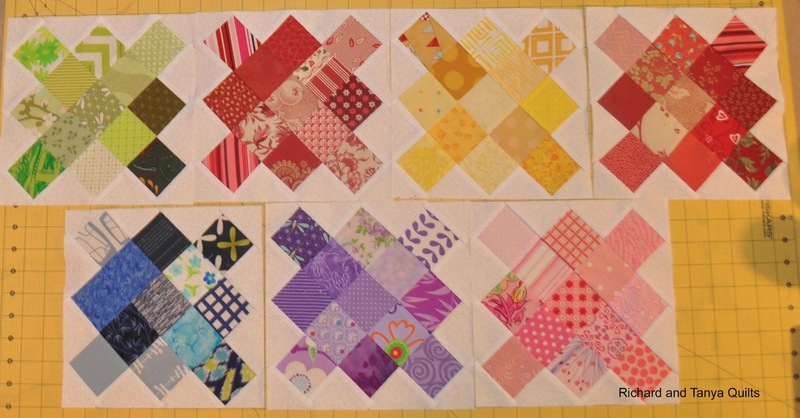 I made the blocks over a year ago and because I decided I hated the fabric (I found the bundle at Walmart before I became a fabric snob) so I quickly put these vanishing 9 patch blocks together. 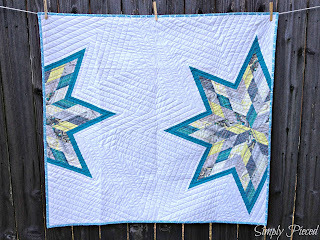 We already had a back for this so it should be a easy quilt to finish. Not great material but its at least not in a box any more. 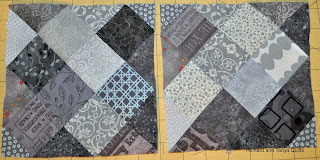 Along with my funky fabric we found the blocks that we started for our ghastly quilts. 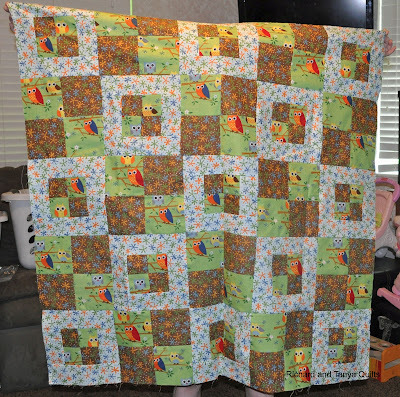 We finished one quilt last year and gave it to Tanya's Sister. We have enough material to make at least 1 more quilt and 4-5 wall hangings which we plan to get done before October to put up for sell. 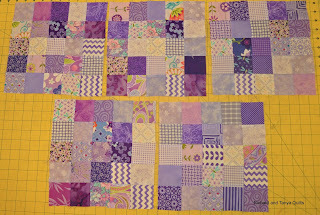 The plan is to have these as 2 rows of the quilt we have a few other rows to go between also it will look neat I think when done. And lastly I got a few more of my granny blocks done. 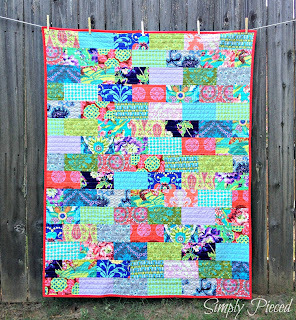 This rag quilt has 3 fabrics on front, green with dots flannel, cat flannel and ivory minky. The back is the green dot flannel. One of our cats had to get in picture since it was a cat print. I think this one turned out super cute. I asked Jared what he thought of it since it has cats and is green, he told me it was for a girl since there were pink butterflies on it. Tune in next week to see next rag quilt from stash. Here is a full shot of the quilt. It has a cute Owl pattern on it. I bet this will be one that sells fast once we get it on the Etsy Store. As of now, its just in the pile to baste. Tanya and I spent most of the day yesterday going though the piles of mess in the sewing room and guess what? Yes we found even more flannel that we did not realize we had? 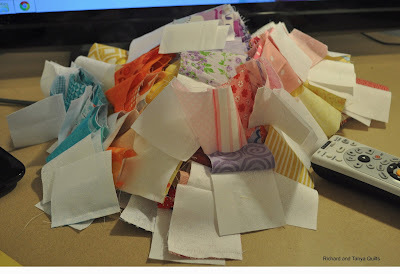 Hum, I think Tanya's stash is going to go on for about 25 quilts (my old guess was 20). These strings were made by Rebecca out of my left over scraps. Speaking of the cleaning yesterday, it turns out I have a huge storage box now full of stuff for strings. I sorted out the pile of leftover junk from quilts of the past into 3 piles. 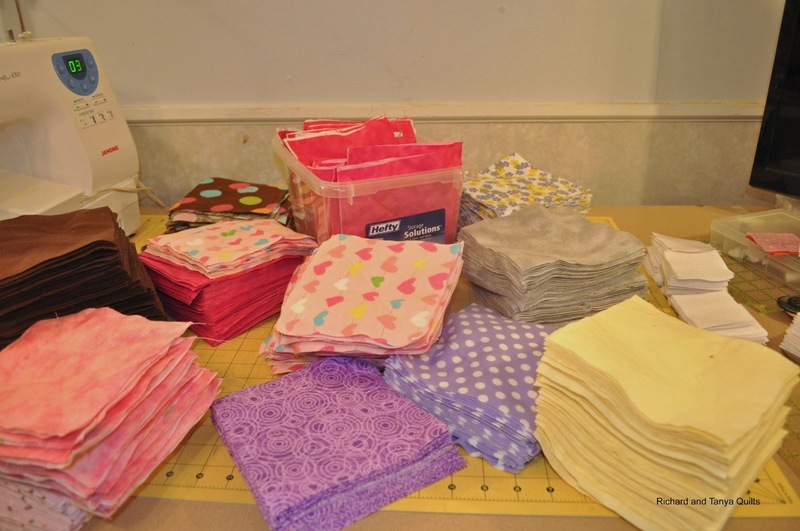 Pieces of fabric big enough to go into a box for future quilts, big enough for 2 1/2 inch blocks, and strings for the string quilt project that we have tasked Rebecca with doing. (She tends to mess the house up less when working, then just playing) so this may be another thing for at least the rest of summer we will have many to show off. As for me I am still on the Granny tangent. 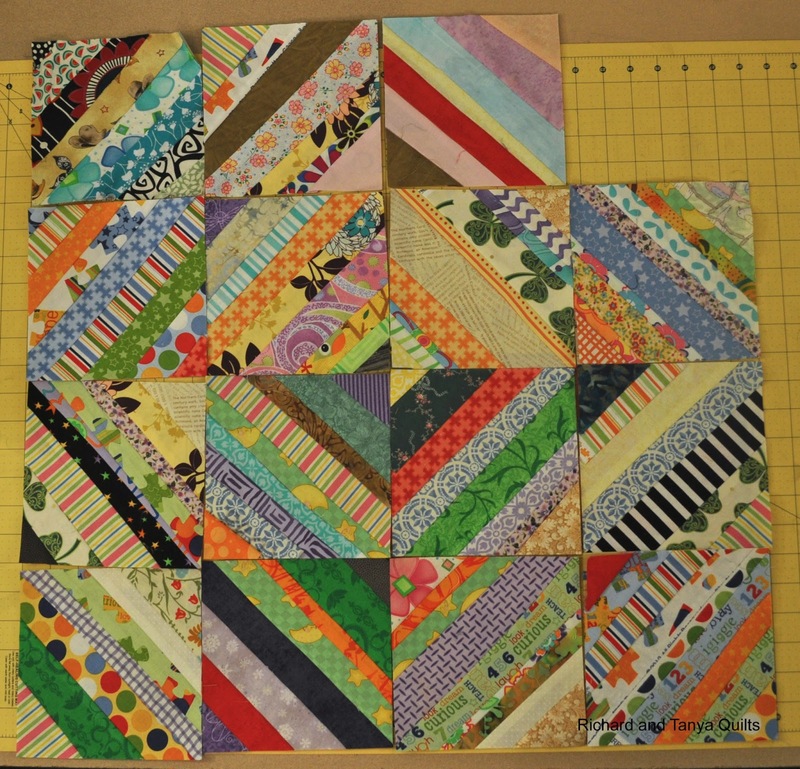 They are not completed yet, but these are block rows that just need to be ironed and then sewn back together. After the 4+ hours of cleaning/sorting I spent the rest of the day doing these and watching movies with Tanya. Hum which project should I work on next? Tanya thinks that huge pile of quilts that are basted should be done, but what fun would that be. I think we need a couple more tops to make her feel like she needs to buy another couple boxes of pins. I bet we have 10 boxes of safety pins right now basted into quilts. Where will we put them all, once I finally quilt a few. This is one of the quilts that was in the pile to quilt. The top was finished over a month ago. It uses our Baby Brick Pattern and is done with yellows and gray from Glimma. The back is a charcoal gray from Kona. This will be added to our Etsy store. 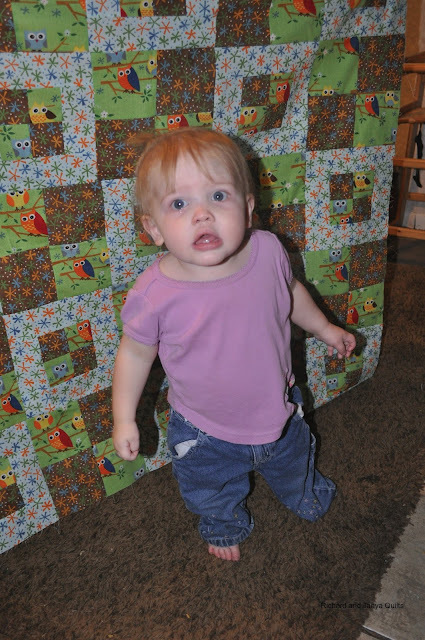 Here is a picture of its twin being quilted. I don't know how much I ever talked about this quilt top, I finished it like a year or so ago. It it twin sized, one of the biggest I have ever made. I made a twin for Rebecca and finished it. This one has sat in a pile for a long time being neglected. Not for lack of love, but you would think so. It took 6 months after I made the top to make a back for it. After all, I did not know how to make a back that big (yea I know, only a twin, but that is huge to me) Then it sat again, because Tanya did not want to baste it. 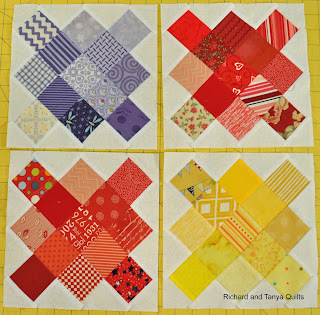 Well I am glad to say Tanya has about given up on me quilting anything, because I have been obsessed with granny squares and other 2 1/2 inch blocks (after all she has like 8 quilts basted ready for me to quilt). 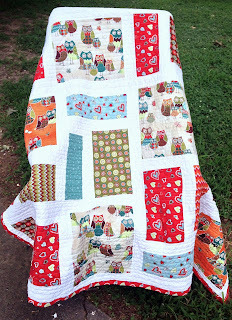 She sat down this last weekend and she basted the above quilt. So I must change focus and quilt it. 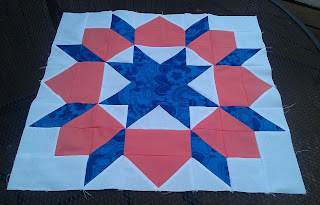 Now how the heck should I quilt this one? Hum it better not be another 6 months figuring that out. Any way it is on the table and next up to go in the machine. I do not generally do directs adds in my blogs, but I want to take the time to thank those that follow my blog and support me in my blogging effort whether that be commenting on my blog or visiting the various sponsors by following the advertisement links found here on my blog. A couple months back I was introduced to Craftsy and now love it. Not only do I sell patterns though Craftsy, but I am a affiliate using there advertisements and get a little money off that. In the past I have got revenue from new people signing up for Craftsy and for those that have signed up though my site got a percentage of money from classes they sign up for. Starting today (or soon, I did not read the fine print very well) I will start getting money from the sell of supplies bought if you are referred though me. 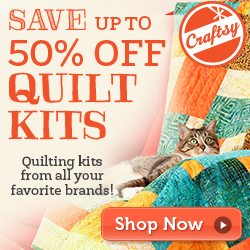 If you have not signed up for Craftsy please do click on the link to the left and do so. 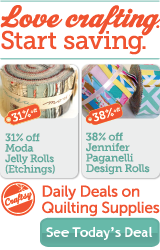 Buy a class or buy some quilting supplies and you can make me rich (OK maybe only in my dreams). To entice you to visit if you do so look me up and comment on a pattern or project of mine on Craftsy and I will give you a free pattern of your choice. If you make me rich, I can afford to have a new giveaway? 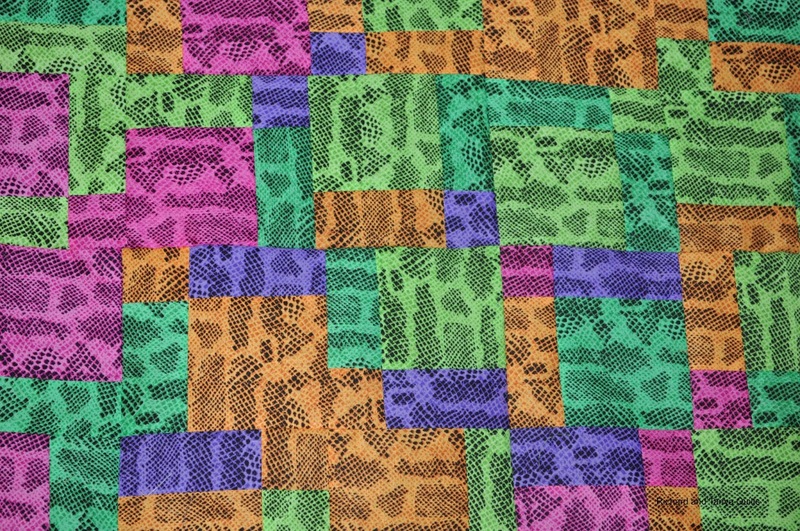 (comment here also if you want a pattern and the name of it, on Craftsy just leave a nice comment about the item you chose to comment on). 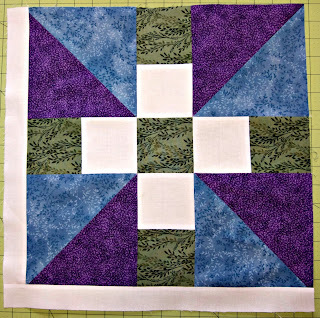 I am off the sells soap box and yes still making various blocks while trying to avoid quilting all those quilts Tanya wants done. Wait, I guess these 2 Tanya made, so its not just me making quilt blocks? What she plans for these I am not sure, but I am sure she is up to something. Oh ya, some purple blocks I did. Hum, I thought I was done cutting flannel. Yes I found a few more bolts that were missed that first time! Last, if not least I have a pile of these? Hum what the heck am I chopping piles of scraps for? Oh ya, I did make a couple more granny squares while Tanya was looking the other way. This one is a combination of cotton on top, and flannel back. 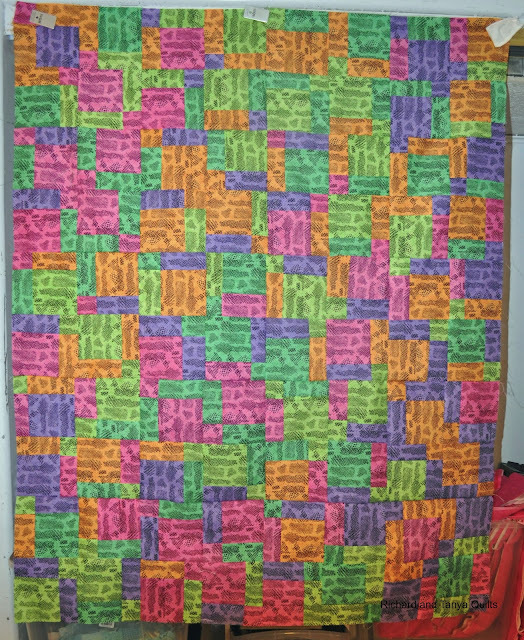 It is the leftovers from a quilt we made for our brother in law for Christmas last year. Richard really likes this one. This one we pre-washed twice. I think we turned 5 color catchers pink, besides soaking it in vinegar. Wait ... More Granny Squares. First baby top finished, many more to go.